This weekend I had a conversation with a fund manager friend who I admire. He lives in the Asia-pac region and has tremendous knowledge of and insight into markets. I asked him what his advice would be. He told me it’s simple. My advice for the next three months is patience. My advice for the next three years is precious metals. People often feel the need to complicate things by over-trading and over-thinking the situation. 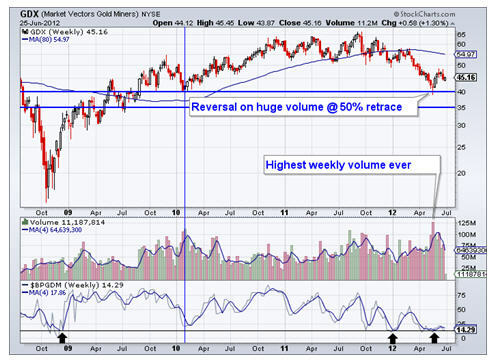 In this piece, we want to keep it simple for Gold and Silver and the mining shares. The first chart is the chart we published back in May when suggesting that a major bottom could be at hand. This weekly chart shows a rebound that may be fading yet the breadth indicator at the bottom (when smoothed) remains as oversold as it was in December and back in 2008. Note that in September 2008, the bullish percent index (4-week MA) was at 50%. Today it lies at 14%. 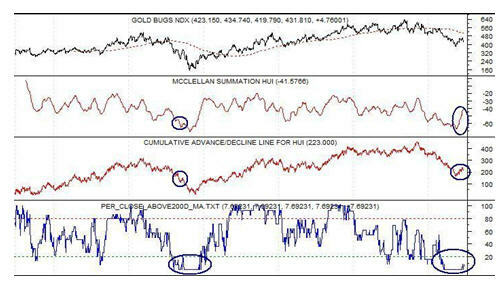 The next chart from SentimenTrader.com, shows the HUI Gold Bugs Index with three different breadth indicators. We show these not to state the obvious. We’ve drawn circles to let you draw your own conclusions. Should gold stocks retest the low then we’ll be looking at these breadth indicators for potential positive divergences which would send a strong bullish signal. One reason we’ve been optimistic is because the shares have performed well amid the flaccid rebound in Gold and Silver. The shares always lead coming out of rebounds, so that recent action is a positive sign. However, the shares won’t perform well if Gold and Silver don’t confirm their bottoms. In fact, there is noticeable but slight deterioration in the charts. 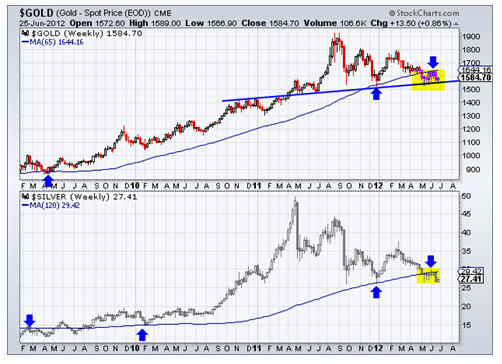 Gold has failed to recapture its 65-week moving average which has essentially supported the entire bull market ex 2008. Meanwhile, Silver has failed to recapture its120-week moving average which provided key support in 2010 and at the end of December. All being said, it is important to recognize that a technical breakdown would be in the context of a correction in its latter stages. Gold is nearly 20% off its high while Silver is about 45% off its high. The shares have essentially been in a bear market for 18 months. In other words, the metals could break to new lows but we wouldn’t expect the lower prices incurred from a breakdown to be sustained beyond the short-term. The plan of action should be fairly simple going forward. If the metals break to new lows, one should begin buying after the breakdown. Specific targets have been discussed with our subscribers. Regarding the shares, one should begin accumulation on a retest of the low. What happens if these markets firm? In that case, wait for support to be confirmed and then accumulate. It is simple but it requires constant patience. In the meantime, if one is too heavily long they could consider hedging their exposure with the inverse ETFs. In our research we continue to focus on those companies best suited to rebound quickly and prosper from the coming cyclical bull market. If you’d be interested in professional guidance in this endeavor, then we invite you to learn more about our service. So to conclude, exercise some patience in the short-term but make sure you are invested in the metals and the gold shares to take advantage of the next several years.